Despite the Rostyle wheels being pretty much solid, you can still see the brake calipers on the front and the drums on the back through the holes. As we had pretty full tins of heat-proof paint from the engine block paint jobs, we set about with the brushes. This is really just a cosmetic job for now. 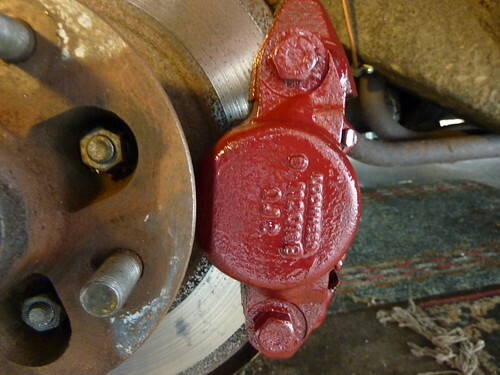 I'll be replacing the front suspension bushes shortly, so I'll give the calipers a more thorough paint when I've got them off the car for that. In the meantime a quick but careful coat of paint on the most visible side should make a difference to how the wheel looks. As the rear brakes are drums, they also need painting - even more so as being drums you can see the rust through every hole in the wheel. This was an easier job as there were much less fiddly parts involved. I decided on using the engine block maroon paint on the calipers to highlight them a little, and black on the drums to help them blend into the wheels - seeing red though every hole would look a little strange.